Maria enjoys spending her spare time with family and friends. She enjoys spending time in her garden and cooking. 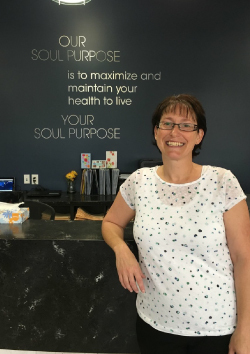 Maria has been with the Confederation Chiropractic Clinic team since 2004. 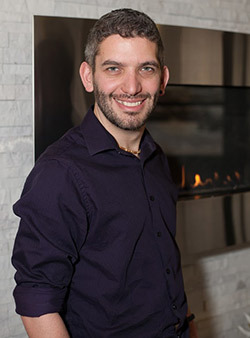 Brad graduated with distinction from the Professional Institute of Massage Therapy in 2015 and is a member of the Massage Therapist Association of Saskatchewan (MTAS). His treatments range from relaxation to deep tissue massage, incorporating both traditional hands on massage and Instrument Assisted Soft Tissue Mobilization (IASTM). He focuses on relaxing tight aching muscles and excels with reducing tension headaches, thoracic outlet syndrome, and tendinosis issues, to name a few. Brad enjoys remaining active whether it be at the gym or taking his dog for runs in the park. During the warmer months, Brad is also an avid fire poi spinner, enjoying both teaching it and performing for different events in and around Saskatoon. He was captivated in 2008 by the level of full body awareness and muscle memory it required and hasn’t been able to put them down since. 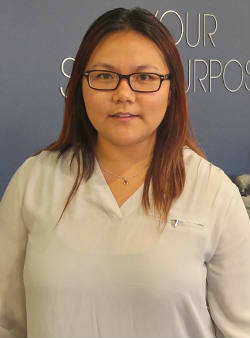 Christina graduated with honours from Mckay Massage and Hydrotherapy program in 2014 and is a member of the Massage Therapist Association of Saskatchewan (MTAS). She’s very passionate about massage therapy because she loves helping people. Her treatments include Swedish massage, deep tissue, trigger point release, joint mobilization, muscle energy technique, and myofascial cupping therapy. She utilizes these various techniques to help her clients who are experiencing pain from spasmodic and tight muscles due to injuries, poor posture, repetitive use, and general stiffness. She is also excited about adding more modalities and techniques into her future practice. Christina enjoys nature, music, hiking, reading, cooking,and yoga. Rhoda has always believed in a natural approach to health care, so massage therapy was a natural career choice. 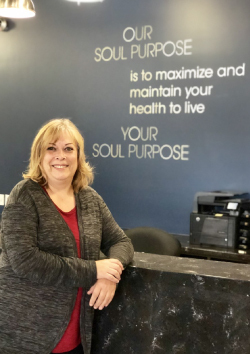 She recently completed one of her long-term goals when she graduated from the McKay Massage and Hydrotherapy program in 2018. She is now a registered massage therapist with the Massage Therapist Association of Saskatchewan (MTAS). Rhoda currently incorporates traditional Swedish massage, joint play, trigger point therapy, and myofascial therapy into her treatments. One of her passions is pre-natal massage. She is excited to continue expanding her tool chest of treatment techniques. In her spare time Rhoda is an avid hockey mom who enjoys cooking, sewing, and spending time with family (and goats!) at the farm. Nahid comes to us from Iran. She has an extensive medical background, graduating in 1995 from the University of Medical Sciences with a doctorate in medicine followed by 7 years working as a medical doctor in emergency at a hospital in Mashhad. In 2003, Nahid moved to Beijing, China to study at the China Academy of Traditional Medicine, receiving a degree in acupuncture. Upon returning to Iran, Nahid worked at the Mashhad hospital as both a medical doctor and acupuncturist. 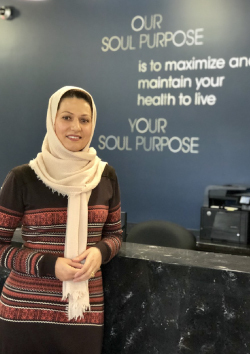 In addition to the hospital, Nahid worked as an acupuncturist at a medical clinic. She then opened her own clinic and continued to work as a highly qualified acupuncturist for 12 years, treating patients with such conditions as migraines, sciatica, disc problems, lumbago, osteoarthritis, tennis elbow, neck and shoulder pain, frozen shoulder, obesity, and depression. It should also be noted that Nahid is certified in cosmetic acupuncture which can aid the body in producing more collagen, thereby reducing wrinkles in the skin. In her free time, Nahid enjoys spending time with family and friends. She partakes in meditation regularly and her hobbies include painting, yoga, and bike riding. Call Confederation Chiropractic Clinic at (306) 978-7788 to schedule your consultation.